It’s been a very hectic, exciting and rewarding year for the Shirley Chisholm Project. 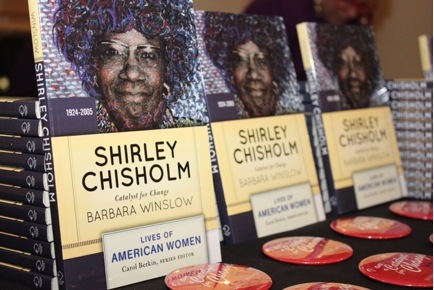 We have been on the road publicizing Project Director Barbara Winslow’s Shirley Chisholm: Catalyst for Change (Westview Press, 2013), the first scholarly biography of Chisholm. The book’s publication has taken us to Brooklyn, Manhattan, San Diego and Los Angeles, California, Cleveland, Ohio, Atlanta, Georgia, and New Orleans, Louisiana. We were also on television in New York as well. 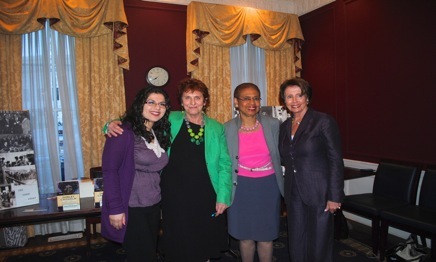 But the most exciting time for us was the book party in Washington D.C. where Speaker Nancy Pelosi and Congresswoman Eleanor Holmes Norton gave greetings. 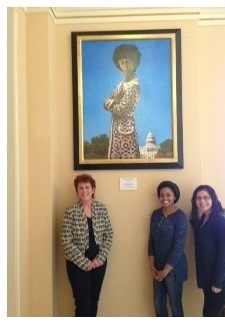 In addition, Leader Pelosi’s wonderful staff took us on a memorable tour of the Capitol Building, where we saw Chisholm’s Portrait. 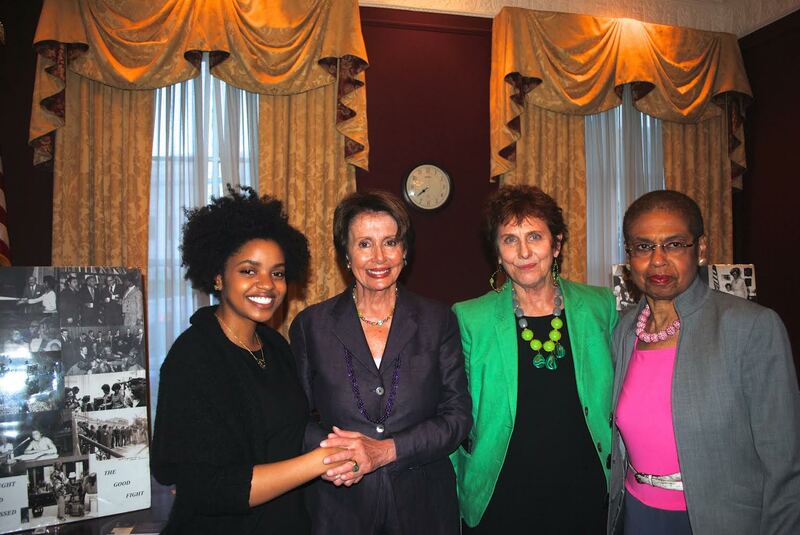 (L-R): Project Manager Leslie Anselme, Speaker Nancy Pelosi, Project Director Barbara Winslow and Congresswoman Eleanor Holmes Norton at Catalyst for Change Book Party at the Mott House in Washington D.C.
Norton and Speaker Nancy Pelosi at Catalyst for Change Book Party at the Mott House in Washington D.C.
(L-R): Project Manager Leslie Anselme, Videographer Nila Popal; Administrative Specialist at the BrooklynCollege Women & Gender Studies Program, Irva Adams at Catalyst for Change Book Party at the North StarFund Offices in New York, NY. 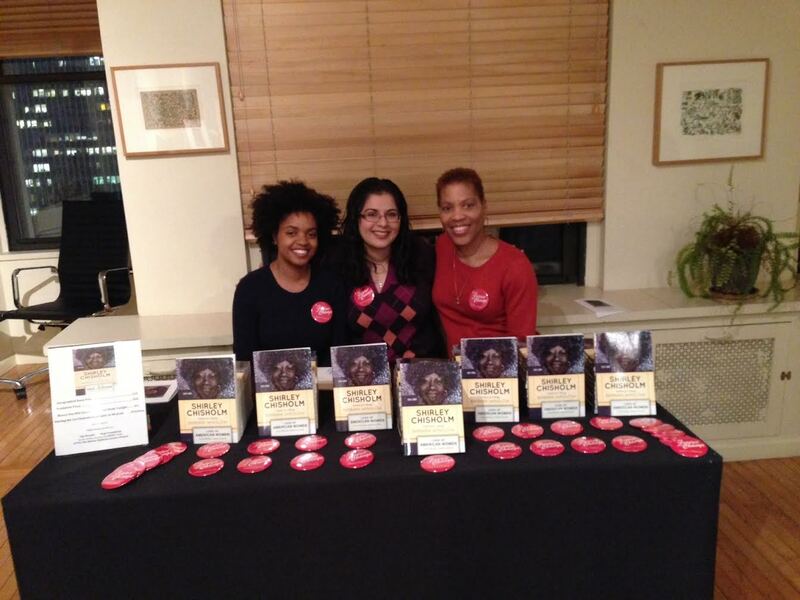 Every November, the Shirley Chisholm project hosts Shirley Chisholm Day events at Brooklyn College. Over 500 Brooklyn College students, faculty, staff, community members and elected officials attended. 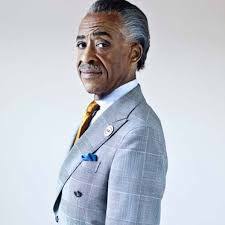 This year the Reverend Al Sharpton was our keynote speaker. Because of events in Ferguson, Missouri, he could not attend, but sent us a taped presentation about his experiences working on her 1972 presidential campaign. New York State Assemblyperson Rodneyse Bichotte gave greetings, as did Deputy Borough President Diana Reyna, who presented a citation from the Borough President, Eric Adams. Following these presentations a panel of scholar activists, Professors Haroon Kharem of the Childhood and Special Education Department, Zinga Fraser, Women’s and Gender Studies Endowed Scholar and Frank Roberts, NYU, led an inspiring panel on the meaning of Ferguson. In fact so inspiring that a BC student Leah Soffian carried this image with her when she joined tens of thousands to protest Ferguson, Staten Island and racial injustice. Our next Project is to deliver a copy of Shirley Chisholm, Catalyst for Change into every middle and high school in Brooklyn. We will keep you posted. Finally, we wish everyone all the best for the coming year. We must continue to be “Catalysts for Change,” in our struggle for social justice, peace and a sustainable planet. We’re incredibly grateful to all who have donated so far. Anything you can give insures the Project’s survival and success. Won’t you consider making a donation? YES! 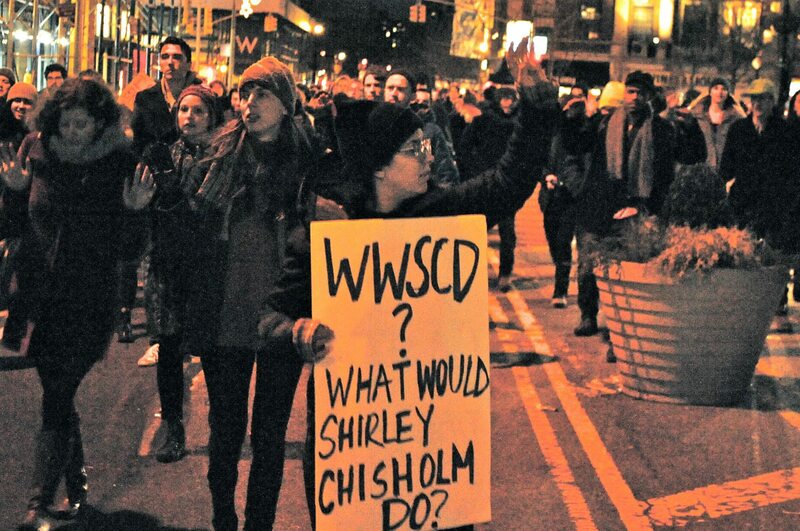 I want to donate to the Shirley Chisholm Project of Brooklyn Women’s Activism 1945 to the Present. Thank you again and all the best wishes for holiday season and the New Year.